Tens of thousands of people protested in Brazil’s largest cities Monday over dissatisfaction with the high cost of living and a stalled economy. In São Paulo, what began with demonstrations against a hike in bus fares quickly grew to include Brazilians already incensed by the millions of dollars the government will spend on hosting a series of large-scale sporting events, such as the current Confederations Cup, the 2014 FIFA World Cup and the 2016 Olympic Games. During the inaugural game of the Confederations Cup over the weekend, protesters jeered President Dilma Rousseff’s opening speech. In Rio de Janeiro, protesters also voiced their anger at the state of public education and healthcare services in the country. A heavy crackdown by police last week only worked to bring more protesters to the streets. They have vowed to carry out their biggest ever demonstrations in the effort to bring down the public transport fares with protests simultaneously scheduled in more than 20 Brazilian cities. 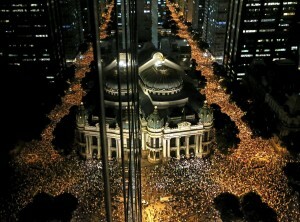 Brazil has not seen such demonstrations in more than 25 years. In the capital Brasilia, a number of peaceful protesters marched on Congress, and managed to gain access to a low-lying roof of the building. Some windows were broken in the building, but police said they were committed to an earlier pledge not to use force unless there was significant property damage.